My teaching career was broad and expansive. The first decade was spent teaching in small districts the size of Benjamin (97 students) and as large as Wichita Falls. Both public and private schools. The next fifteen years I taught in metro districts the size of Fort Worth and Dallas. During the last years I taught everything from American History to Ancient History in state college and private universities. In Fort Worth, I taught four years before being promoted to Vice Principal of a large middle school in South Fort Worth. My first meeting with the principal, I was told my first job was to get rid of the drugs and prostitutes on or near the campus. Then the bad teachers. The 2,500 plus populated campus was indeed a challenge. The principal arrived at the school late, took an early lunch and was off campus by 3 p.m. The other Vice Principal and I managed the school. I was charged with security, transportation, special education, and the evaluation of about half the 120 member staff. On any given day around a hundred referrals would be made by teachers for discipline. My options for punishment were: talk and return them to class, time out, corporal punishment, suspension, and threaten. I never used the first and last possibilities. Each year we lost numerous students to death caused by drug overdose, incarceration, auto accidents, murder, illness, and suicide. My most horrid job was attending funerals of students on behalf of the school. About a dozen each year. My responsibility was to represent the school and testify to the importance of the deceased to our school. Other church representatives, relatives and friends would stand and offer condolences and say kind things about the deceased. My second year, a kid named Billy moved into the neighborhood. He was small, shabbily dressed, and reeked of poverty. He could neither read nor write but got into fights on a daily basis. He usually got beat up and taken to the nurse’s office. I investigated. Many times he was the instigator of the misbehavior. For his own protection I placed him in a small room (really just a closet) adjacent to my office. Teachers brought his work and during the day, with the assistance of the librarian, we helped with his lessons. The neighborhood was so bad that during the spring the city established a temporary morgue. It was across from the school because there were so many deaths the downtown morgue would be full. I averaged confiscating a couple of guns a month from the students. Plus a whole host of other weapons. The third year I rarely left the school unless for a discipline hearing, court, or funeral. One day I had an infected tooth. There was a school board member who was a pharmacist. I called him and he called a dentist for me to see. My right eye was so swollen I could not see. Two hours later I returned to the school. My face was so distorted the kids were frightened. Yet I still performed after school bus duty. I got a written reprimand from the principal for taking school time for personal business. The next morning Billy was waiting for me in my office for fighting. I asked him why he was always fighting. “Because nobody likes me” he said. I placed him in his little room and gave him some work to do. “Thanks Mr. Caussey, I feel safe in here with you,” he said. Billy was seeing the counselor every day now. We could not get his parents to come to the school. When I suspended him, I always drove him home. He lived in a terrible shack with a caved in front porch and broken windows. We got his parents food assistance from the Baptist Church, and the Salvation Army was paying utilities. One day I took Billy home. “Mr. Caussey, could you come around back? I want to show you something,” he asked. “Billy, I am sorry I don’t have the time. I need to get back,” I replied. “Please Mr. Caussey, I want to show you my friends.” With great pride Billy pointed toward a chicken-type-coop filled with pigeons. “These are my friends,” he said. As we approached, the pigeons seemed to all take flight. He opened the door and stepped inside. They began to land on his head, shoulders, and extended arms. I could barely see his face and bright baby blue eyes. He was all smiles. Suddenly he shooed them away and they shuffled around onto the ground, gathering over his legs and feet. Reaching In his pocket he pulled out slices of bread and began to feed the pigeons. “Don’t worry Mr. Caussey. The ladies in the cafeteria let me get it out of the trash cans. I can have all I want,” he said. I spent an hour there with Billy listening to pigeon stories. A little boy in love with something that in turn, returned that love. My schedule became even more hectic as the year progressed. Gangs had moved into a neighboring high school, and there were fights every day that spilled onto my campus. Billy was now spending his time with different teachers, making nice progress in math and reading. We were so excited and pleased to hear this. One early Wednesday late in the school year, I was asked to report immediately to the principal’s office. When I arrived the principal had his back to me, the nurse was crying, the counselor had eyes on the ground. The security guard looked me directly in the eye and shook his head. “It was only last week, Mr. Caussey, he told me he loved you nearly as much as his pigeons,” said the counselor. The casket was made of nondescriptive brown wood. Billy’s face was covered with a white mask with eye holes and a mouth drawn. Small blond hairs crinkled from under the mask resting on his forehead. The crowd was small. His parents, older sister, police detective, two funeral home employees and two neighbors. I told them about his school work and about his pigeons. This was my last year at the school. I was out of education for the next three years, then moved to Dallas and started teaching fifth grade special education. I continued to teach college classes as well. Before Christmas, JoAnn and I took our annual pilgrimage to Galveston. We ate lunch at a place called Black Pearl Restaurant near the Strand. We had a table next to the large window that looked over a sidewalk and street. 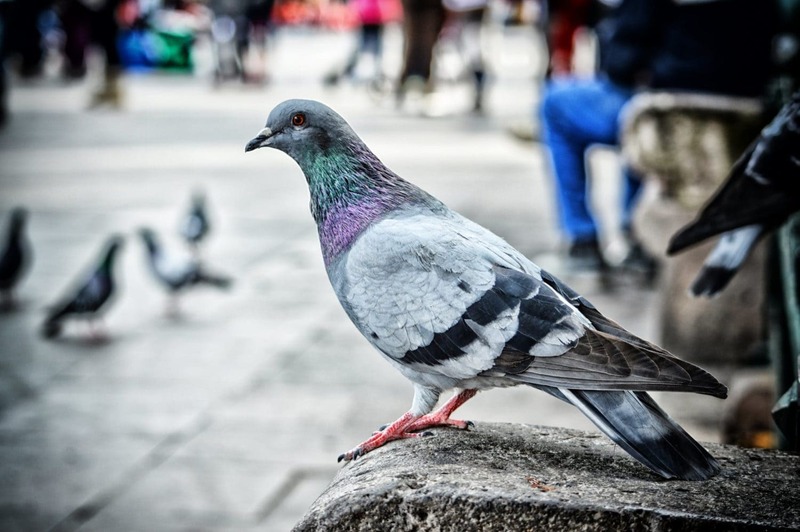 The sidewalk was occupied by seven pairs of strutting, cooing pressing, loving pigeons. I told her all about pigeons. She was so impressed she asked where I leaned so much. I told her about Billy. Even though it had been over 30 years, JoAnn was the only person I had told about Billy. Now you. I remember as though it was yesterday. Maybe I can forgive myself someday. The memories are freshened when I see pigeons in parks, on buildings or airborne. How long will I remember it? As long as pigeons fly and little boys dream. Durhl Caussey writes a column read across America. He may be reached at this paper or dcaussey@sbcglobal.net.